Reason 5 even has its own sample editor. For years, one of the main complaints about Propellerhead's Reason has been that it doesn't have any kind of audio input. However, it's just been revealed that this limitation is being at least partly addressed in Reason 5 with the addition of live sampling. 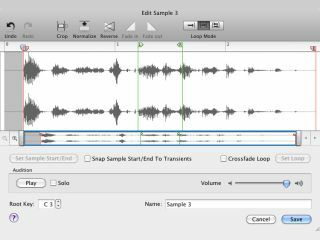 This new feature enables any of Reason's sample players to record incoming audio at the touch of a button. This can be done on the fly, and there's a built-in sample editor too. There's also root key pitch detection and automatic zone mapping, which should make it easy to map samples across your keyboard. There's more in the video above; come back tomorrow for the final new feature in Reason 5/Record 1.5.